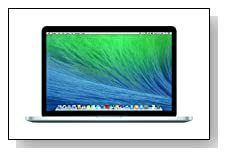 The MacBook Pro MGX72LL/A is the new 13.3 inch laptop with Retina display released at the end of July 2014 by Apple. What’s different with the new Macbook is the faster Haswell i5 processor and longer battery life- 9 hours vs 7 hrs of the previous October 2013 model Retina Macbook Pro. 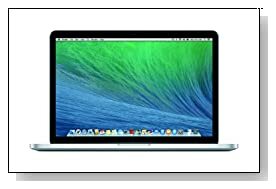 Everything else- all other specs stay pretty much the same as before but if you have a 2012 Macbook or prior, this one has better graphics card, faster processor, longer battery life, storage and more. The new Apple MacBook Pro comes with the 4th generation Intel i5-4278U processor (3 MB shared L3 cache) at 2.6 GHz to 3.1 Ghz speed with turbo boost and with hyper threading function for using the CPU better by two cores being able to handle four cores in parallel so it is almost as fast as the Intel i7-3520M, 8 GB DDR3L SDRAM at 1600 MHz, 128 GB PCIe-based Flash Storage- Solid State Drive with 60 percent faster read and write times that brings quicker boot-ups and better overall performance- you can put it to sleep for up to a month without plugging it in and it will wake up instantly and 64-bit OS X Mavericks advertised as the world’s best- most advanced desktop operating system with a Time Machine backup that backs up the system data automatically to an external drive. The TDP- Thermal Design Power of 28 Watt of the new Intel i5 processor helps with the low energy usage and longer battery life. 13.3 inch LED backlit glossy finish but reduced glare widescreen Retina display with IPS- 178 degree viewing angles and 2560 x 1600 pixel screen resolution- 227 pixels per inch and total pixels of 5 million+ offers high contrast and vibrant colours and Intel Iris Graphics 5100 which is an equivalent of the lower end dedicated graphics card NVIDIA GeForce GT 720M and much faster (2x) than the Intel HD 4000, letting you play the modern day games at low to medium settings. Apple MacBook Pro has the FaceTime HD webcam for video calls up to 720p with almost real-life clarity, supporting widescreen 16:9 cinematic aspect ratio and dual integrated microphones. The dual speakers on the new Macbook offer a sharp, crisp, loud and balanced sound with a wide dynamic range even though Macbook is so light and thin. You can connect up to 2 external displays with up to 2560 x 1600 resolution simultaneously via the thunderbolt- Mini DisplayPort and without needing an adapter if the display is Mini DisplayPort compatible, then you have the HDMI port to connect to your large screen HDTV easily as well. The new silver Apple MacBook Pro is modern, sleek and light- weighs only 3.5 pounds with the measurements of 8.62 x 12.35 x 0.71 inches, It gives you up to 9 hours of battery life in average use from is lithium polymer (LiPo) battery that is not removable, also with the advanced power management features. It has a very comfy and ergonomic backlit chiclet style keyboard for accurate typing and a responsive glass trackpad with the whole surface clickable rather than just the bottom and that supports multiple gestures. There is no optical drive on the Retina Macbook but fast 802.11ac wireless with larger coverage and speedier connection and that also supports the a/b/g/n wireless networks, Bluetooth 4.0, 2 x USB 3.0 ports- backward compatible with the USB 2.0 ports, 1 x Audio-out port, 2 x Thunderbolt ports to transfer data at 20 Gbps, an HDMI port, an SDXC Card slot and a MagSafe 2 power port. You get the standard Apple software iMovie, iPhoto, Numbers, Pages, Keynote and GarageBand included. Conclusion: The mid-2014 model Apple MacBook Pro with Retina display is a very good-looking and powerful machine with a beautiful design of super slim and super portable single aluminium unibody, that make it look more like a Macbook Air than a conventional Macbook Pro, a fast Haswell i5 processor, a large 8GB memory, the SSD that makes it even snappier and the amazing Retina display with the 2560 x 1600 pixel resolution, a very solid battery life. Nothing seems to be removable on the new Macbook Pro- it has a unibody design that has everything glued together and if you need to upgrade anything you’d need to turn to Apple for help and this was the case with the late 2013 model Macbook Pro but not the previous models. Apple MacBooks are not cheap but you get more than what you pay for good looks and great aesthetics, powerful and solid internal components, amazing display and solid battery life. You can run pro applications like Final Cut Pro and Aperture easily and suitable for any graphics and video work and some gaming- latest 3D games can be run at lower to medium resolutions and settings with its Intel Iris GPU, can handle graphics editing programs very easily- maybe a little heating but not often and the 128 GB storage space can fill up pretty quickly and it is not expandable so you may want to perhaps opt for the 256 GB flash storage option. Great design, powerful, fast and trouble-free computing- very highly recommended! This is another masterpiece from Apple with the looks and the latest technology.